The All-New Aprilia SR 125 comes with the super-efficient powerful 125cc engine. It’s all about the thrill, having a great time and never stopping and it’s all about Racing. Aprilia SR 125 gives an existing racing feel throughout the ride with the 1-cylinder air cooled engine, producing 9.46 BHP @ 8500 rpm and 8.2 NM @ 7500 rpm. Racing is not just about one thing, but it is about many. It is not just about winning – even the best lose, but they don’t give up. Yes! for its racing roar, Aprilia SR 125 is equipped with its unique Features, Styling, Engine, Dimension, Handling, Suspension, Comfort, and so on… Let us now get to know about Aprilia SR 125 features. Aprilia is known for its high-quality products worldwide. Likewise Aprilia, SR 125 got its unique styling to enhance the sporty look for the next-gen enthusiastic riders. Equipped with Pronounced ‘beak‘ on the front wheel for the sporty look and feel. SR 125 comes with a different design with wider wheels than most of the scooters available currently in the market eg: TVS Ntorq and even different than most of the scooters ready for launch in India. Extremely stylish wheels with 355.6mm Black alloy wheels with five spokes. The main attraction of the SR 125 is with the Wider sport street tyres which draw others attention. The wider 14-inch tyres ensure better suspension. The tyre size for both the wheels is 120/70-14. When it comes to the comfortability, the All-New SR 125 equipped with Longer Seats with the seat height of 775 mm which is a good choice for Indian road conditions. Avoids the risk of back pain during long rides. For better grip, avoids major accidents, ensures safety on the sudden brakes. 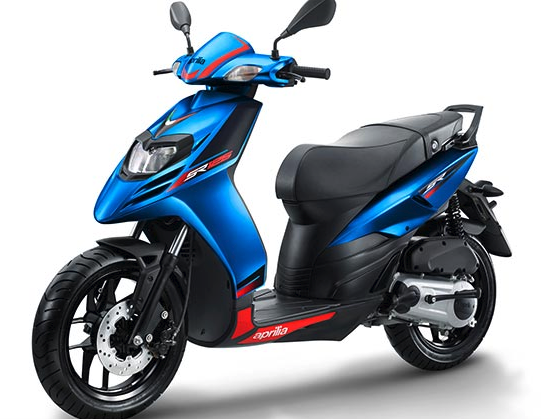 Aprilia SR 125 comes with a 125cc powerful engine for the better economy in terms of mileage and speed. Better enhanced Speedometer for better accessibility with Twin-pod analog unit for Speedometer, Fuel Gauge, and Odometer. The scooter looks sport from every angle and its headlight has been integrated into its front body instead of the handlebar assembly. Double barrel headlight unit for wider spread and visibility. The Handle for any scooter has to provide better grips on the sudden brakes. This will avoid major accidents. SR 125 has a Raised unique handlebar and avoids the pain that caused during the acceleration. sporty handlebar integrated turn indicator lights increase the convenience level. Aprilia SR 125 gets a CVT gearbox and a 220 mm ventilated front disc brake with twin piston calipers and 140mm rear drum brake on the front makes it safer than others.